A cross-platform package from BIAS offers high-quality denoising at an affordable price. BIAS's Sound Soap Pro is a four-in-one suite of noise-reduction plug-ins for VST, RTAS, Audio Units, Audiosuite, and Direct X host applications on both the Apple Mac and Windows platforms, designed to deliver high-quality audio clean-up capability with the minimum of user complication. 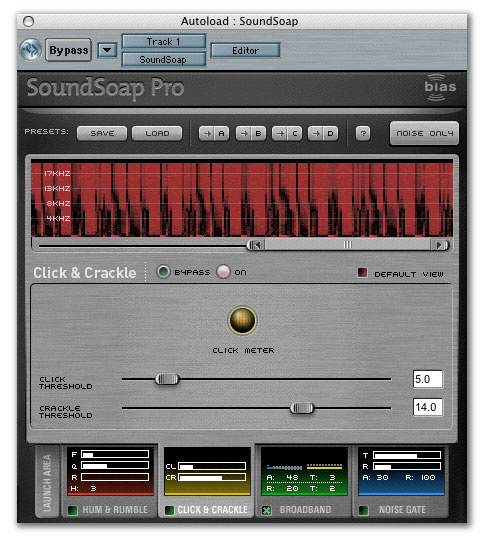 Sound Soap Pro is based on the technology behind BIAS's original Sound Soap, but this version is rather more sophisticated and allows the user access to parameters that were preset in Sound Soap. Each of its four modules is designed to deal with a specific kind of noise, though one of these modules is really just a conventional noise gate, so most of my attention will be directed towards the other three. These are designed to tackle hum and rumble, click and crackle, and broadband noise. The four separate denoising elements in the Sound Soap Pro suite are all accessed via a single, tab-based user interface, with a specific denoising tool accessed by each tab. As you have probably gathered from the description of the modules, Sound Soap Pro is designed to reduce unwanted hiss such as tape or circuit noise, electrical hum, click and crackle (both vinyl surface noise and digital clicks), though it can also deal with many other types of wide-spectrum noise providing they are constant in level, such as camera noise. Though the four modules are very different, some elements are common to all, such as the spectrogram display, Global Presets, a Noise Only audition mode and bypass. Where the host application allows, parameters may also be automated. 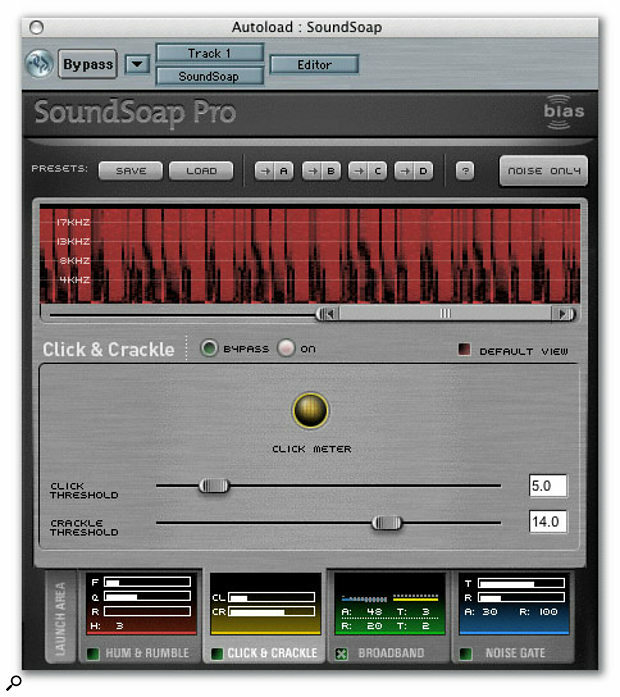 Sound Soap Pro, once installed, appears like any other effect/processor plug-in and I tested it in its Audio Units incarnation via the insert points in both BIAS Peak and Logic Pro. The best way to apply the processes is simply to follow the tabs, which are labelled from left to right as Launch, Hum & Rumble, Click & Crackle, Broadband and Noise Gate. Where there is adequate processing power, the tools can be set up individually then run simultaneously. If a tool is not needed, it can be bypassed to save on CPU power. 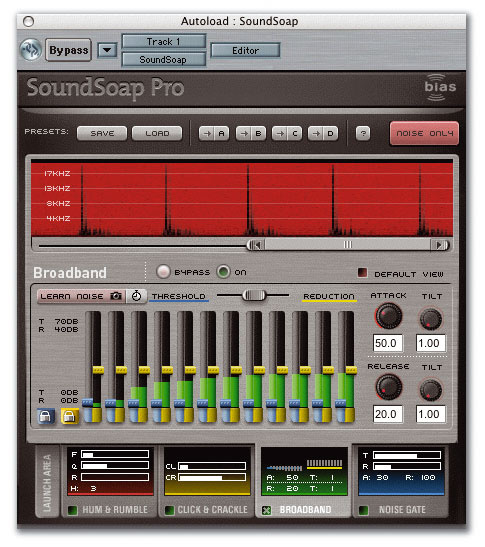 Because Sound Soap Pro comprises four different processing tools, presets can be saved for individual tools or for the complete suite of tools, though where the host software is capable of saving presets, only the settings of the entire plug-in are saved there. 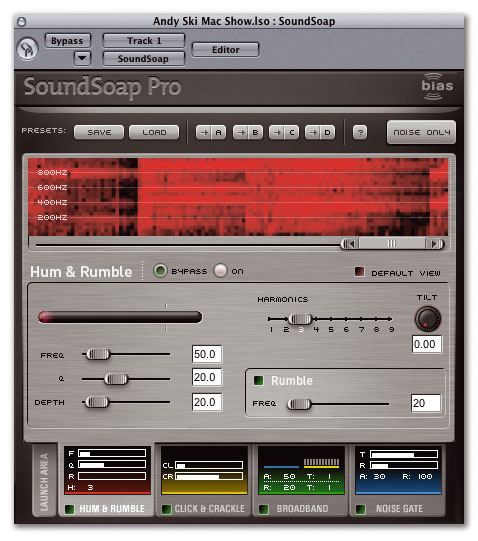 A compare feature allows different sets of settings to be compared, and while most plug-ins only offer 'A' and 'B' settings, Sound Soap Pro has four. A PDF manual is supplied, and clicking the Help button uses your web browser to contact the BIAS web site, where you can obtain various additional tutorials on Sound Soap Pro. The Noise Only button is a means of monitoring that part of the signal that Sound Soap Pro deems to be noise based on the current control settings. If this contains wanted signal as well as noise, then you have the opportunity to revise the parameter settings so as to remove only noise. The spectrogram readout utilises a colour display that scrolls as the audio file plays. The white areas depict the original audio signal, while red shows the processed audio after passing through Sound Soap Pro. Reset and display Freeze buttons are available. In essence, the spectrogram shows where in the frequency spectrum noise is occurring and gives an indication as to which frequencies are being removed by the processing, though I didn't find it awfully helpful as I wasn't quite sure what I was looking at half the time. Beneath the spectrogram is a horizontal fader used for scrolling backward and forward in time and for increasing or decreasing the display zoom magnification. The frequency scale of the spectrogram changes according to the type of noise module being used — for example, the hum and rumble scale extends only up to 4kHz while the broadband noise tools show the complete audio spectrum. The hum and rumble tool includes a useful hum meter which displays the level of hum passing through the filters as you adjust the frequency, so you can use this to visually tune the Hum Frequency slider for the strongest signal over its 20Hz to 200Hz range — this indicates you've tuned to the fundamental frequency of the hum, and all the harmonic filters are derived from multiples of this. Fractions of a Hertz may be typed in but I couldn't find a key command that would let me scroll the value at any higher resolution than 1Hz steps. A Q (bandwidth) slider sets the width of the notch filter from 10 to 50. High Q values create narrower notches, but unless the hum frequency is very stable, it may drift out of the range of the filter if the Q is set too high, so the trick is really to set it as high as you can without the process becoming ineffective. A Depth slider sets the amount of attenuation in the filter band up to a maximum of 50dB. In all probablity, attenuating only the fundamental frequency will reveal further problems at harmonics of that frequency, so the Harmonics slider is used next to attenuate whatever number of harmonics (up to nine) is necessary to get a subjectively good result. Again, the fewer harmonics you notch out, the less the wanted sound will be affected, though with such narrow frequency bands, the filtering is actually pretty transparent. The Harmonics Tilt knob allows the degree of cut to be made progressively less at higher frequencies, where the hum harmonics are usually less prevalent. The Rumble Reduction slider is designed to attenuate very low-frequency noise using a high-pass filter that can be set between 20Hz and 100Hz. This has a slope of 12dB/octave and a Q value of 0.5. Clicks, crackles and pops can't be addessed by simple filtering, as the artifact has to be identified, removed and then filled with a spectrally correct signal based on what the signal looks like either side of the click. Clicks can be caused by dirt and scratches on vinyl records, and can also be introduced in digital audio by copying and pasting without crossfading the edits; sometimes they also appear randomly (and infuriatingly!) because of clock sync problems or data errors. SSP 's click and crackle module has separate sliders for click and crackle detection, so if you have both large clicks and smaller crackles, they can be treated at the same time. The Click Threshold slider adjusts a detector threshold over the range 0 to 25 dB to determine which clicks should be treated and which ignored. Moving the slider to the left will remove progressively more (lower amplitude) clicks. The Crackle Threshold slider does much the same for crackle and has the same range. To aid setting up, a Click Meter illuminates in red to show that a click is being processed. This is really a very simple part of the system to use, but again you need to check the noise-only signal to ensure that nothing is being removed that shouldn't be. 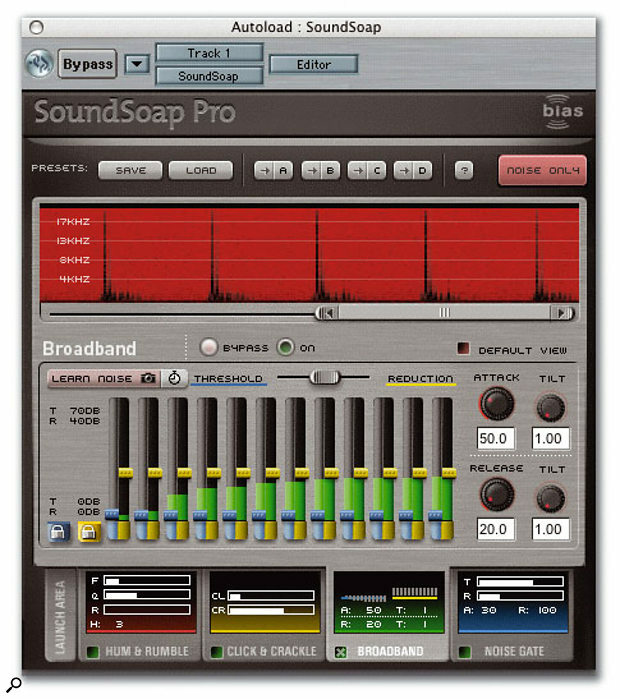 Sound Soap Pro is a dual-platform application and on Apple machines it is recommended that it be run on a G4 or G5 Macintosh computer with a minimum processing speed of 500MHz. It only runs under OS X (10.2 or later) and can be used within any host application that supports the RTAS, VST, Audiosuite, or Audio Units plug-in protocols. Windows users require a Pentium III or Pentium 4 computer with a minimum of 800MHz processing speed, and Sound Soap Pro can run under Windows XP Home or Professional Editions, again with the proviso that you are running a compatible RTAS, Direct X, Audiosuite or VST host application. Hard drive and RAM requirements are modest but you will need a bare minimum of 128MB RAM (256 or more is recommended) and at least 20MB of available hard drive space. Authorisation is via the BIAS web site but there's also a USB key with this version for added security. The types of noise that can be tackled by the broadband noise section encompass any kind of constant noise that covers a broad frequency spectrum, common examples being tape hiss, air-conditioning noise, camera noise, lighting buzz and mechanical noise from a recorder. It's probably fair to say that the broadband noise-reduction tool is the most complex of the modules, but BIAS have still done as much as possible to make it easy to use. When using this tool, it is particularly important to listen to the noise-only signal to make sure nothing wanted is being thrown away. If it is, you can make manual adjustments to the threshold sliders. Sound Soap Pro 's broadband noise reduction works on the familiar principle of splitting the audio signal into a large number of frequency bands, then processing each independently before recombining them. Unlike the other elements of the system, for this process to work, it has to know what the noise spectrum looks like and how loud the noise is, so the material ideally needs to contain an exposed section of noise that you can use to create a 'noise fingerprint'. A section of noise as short as half a second or even less can be analysed manually using the Learn button, or using the timed mode indicated by a stopwatch icon. Sometimes looping the noisy section is the best way to work. Playback must be initiated in order for the learning process to work, after which the noise reduction automatically switches on. The 12 Threshold sliders then move to the appropriate position to subtract out the noise based on the average noise profile created during the Learn phase. Note however that these 12 sliders are simply for display and adjustment — there are actually many more frequency bands under their control. The 12 slider meters indicate the level of audio in each frequency band and the frequencies covered by the bands adapt optimally depending on the measured noise profile's shape. Once the noise has been learned, the Threshold/Reduction View slider allows the display to show the Threshold sliders, the Reduction sliders or both at the same time, where the maximum reduction level is -40dB and the threshold can be set from 0 to -70dB. The Reduction sliders control the amount of noise reduction being applied to each frequency range; by default, all the sliders are locked together and moved as one, but they can be temporarily unlocked to allow them to be moved to different relative positions. Furthermore, they can all be unlocked and left so that they can move independently, or you can choose to lock some sliders and not others. The process can be envisaged as having a separate expander/gate for each of the frequency bands being processed, with Attack and Release controls having initial default values of 75ms and 100ms respectively. Sometimes it is desirable for the process to come in or decay faster in some parts of the audio spectrum than others, so Attack Tilt and Release Tilt knobs provide an easy means to adjust the ratio of attack and release between the low and high frequency bands. The last line of defence is the gate, and like all gates, it can only eliminate noise when no wanted signal is present, as everything gets muted or attenuated. If the noise is low enough to be masked by the wanted sounds, then the gate can be used to achieve complete silence during pauses. It has a display that shows the audio waveform as well as the gate threshold. A Threshold slider sets the level above which the gate opens, and the amount of gain reduction applied when the gate is closed is set using the Reduction slider in the usual way. A Threshold Attack knob adjusts how quickly the gate opens once a signal has passed the threshold, and the Release control sets how fast it closes again once the signal has dropped back below the threshold. As far as I can see, this is a quite conventional gate. My tests involved cleaning up some tracks I'd taken from a favourite vinyl record, and though there was little hum to deal with, there were clicks and crackles in abundance. The clicks were dealt with very effectively without any obvious artifacts, and I'd say that the crackle level was reduced by a subjective 95 percent without messing up the wanted sound. You have to be a little more careful with the broadband reduction tool: my strategy was to move the threshold (locked together) up while listening to the noise-only signal, and then see how high I could get it before recognisable audio started to appear. At this point I backed it off slightly so that noise was once again the only thing being monitored; I then adjusted the noise-removal Depth sliders so that the noise was just low enough to be inaudible beneath the quieter sections of the music. Providing you apply only as little treatment as is necessary using this module, the level of apparent hiss can be reduced very significantly without compromising the audio quality, but if you try to go too far, you can start to remove top end from the audio being treated. Once all the settings are correct, all the processes can be bounced into a new file containing your denoised audio. Sound Soap Pro strikes a sensible balance between lack of complexity and effectiveness, though I'm still trying to find which key I need to hold down to let me roll through the hum frequencies in 0.1Hz steps instead of 1.0Hz steps. The click and crackle tools are certainly effective in improving the sound of vinyl transfers and the broadband noise tool is as easy to use as any other snapshot-based system. As a package for restoring vinyl, removing clicks from digital recordings or reducing the effect of camera noise, Sound Soap Pro is pretty straightforward and generally effective. Inevitably there will be audible artifacts that it doesn't recognise as clicks or crackles, but on the whole it does a very good job and catches most things without too much of a problem. 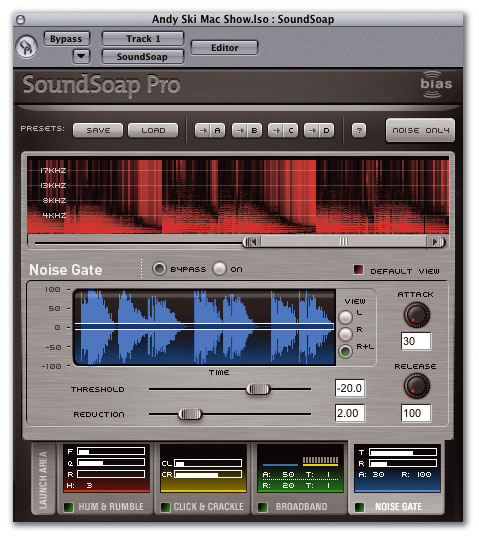 If you need something that's more flexible than a basic clean-up program but you don't want the complexity of a high-end, all-singing solution, then Sound Soap Pro is an excellent compromise. Effective against most broadband noise as well as hum, clicks and crackles. The spectrogram display isn't always easy to interpret. Sound Soap Pro is a good denoising solution for anyone wanting flexibility without undue complexity.